Performance and stability testing – does the equipment meet the end users’ performance and availability specifications? Today’s post deals with the equipment metadata model conformance testing in greater detail. The impetus for the metadata conformance requirement is SEMI Standard E164 – Specification for EDA Common Metadata. Although this standard is not part of the original core suite of EDA standards, it is now being required by GLOBALFOUNDRIES and a number of other major semiconductor manufacturers on EDA-enabled equipment. In other words, conformance to E164 requires a consistent implementation of E125. All state machines required by the GEM300 standards must be implemented and use the same names for required events, parameters, state names and transitions. It requires that all process modules implement the E157 Module Processing state machine using specified names. As a result, E164 ensures a high level of implementation commonality across all equipment types. This commonality enables better automation of data collection processes across the fab, driving major increases in engineering efficiency. In summary, E164 is to EDA what GEM was to SECS-II. Currently, the only E164 conformance tester is Metadata Conformance Analyzer (MCA) that was commissioned by Sematech and implemented by NIST (National Institute of Standards and Technology). In our discussions with potential users of an EDA test tool, most clients agree that the sooner a replacement can be created for MCA, the happier they will be. In a previous post, we mentioned that Cimetrix has automated the EDA compliance evaluation procedures. We are also in the process of designing the performance testing components of this tester. The plan is to also create an E164 conformance tester that will replace MCA. If you want to know more about EDA testing and/or discuss your specific needs or provide input on what you would like to see included for E164 conformance testing, contact Cimetrix for a demonstration of this exciting new capability! Update: Cimetrix EDATester Datasheet available now! Today's post deals with the performance and stability testing in greater detail. In our discussions with EDA users (both OEM implementers and fab end users) about EDA testing, they all acknowledge the need for compliance testing. However, the vast majority have said, “If you can help me automate my performance testing, I would be able to save a huge amount of time.” Most thought they could reduce testing time from several weeks to just a couple of days. Everyone has different ideas about what should be included in performance testing of their EDA software. Everyone can agree that generally they need to test if the equipment meets the end users’ performance and availability specifications in terms of data sampling intervals, overall data volume transmitted, size and number of DCPs (data collection plans) supported, demands on the computing/network resources, and up-time. They also need to know if the software will support the range of application clients expect in a production environment. EDA users want to know the sheer volume of data that can be collected. ISMI has reported in public forums that IC makers expect EDA to achieve data rates of 50+ variables per chamber at rates up to 10 Hz. In EDA specifications, IC makers have requested the ability to gather 1,000 to 2,000 parameters using data collection rates from 5 to 20 Hz, which translates to 40,000 values per second. These rates are easily achievable with today’s computing platform technology, but users also want to know the upper limit. In other words, at what point does the ability to collect data break down? EDA users want to know that the data comes in at the specified rates and that the values and timestamps that are received at those rates are accurate. EDA users want to know how different data collection rates and volumes will affect the system resources. Will memory usage be too high? How will different collection rates affect CPU usage? Is the network bandwidth sufficient for gathering the required data at the required speeds and still maintain high data quality? In a previous post, we mentioned that Cimetrix has automated the EDA compliance evaluation procedures. The newly released Cimetrix EDATesterTM is the integrated solution that supports the broadest range of use cases in SEMI Equipment Data Acquisition (EDA/Interface A) standards compliance testing in the industry. The Cimetrix EDATester automates the execution of the ISMI EDA Evaluation Method and features performance testing that characterizes the capabilities and limitations of a tool’s EDA interface. Download the data sheet and see how the Cimetrix EDATester supports your objectives. If you want to know more about EDA testing and/or discuss your specific needs, contact Cimetrix for a demonstration of this exciting new capability! Today’s post deals with the first of these parts in greater detail. To begin, we should point out that standards compliance testing is not a new idea – it has been an integral part of the acceptance testing process for automated manufacturing equipment for decades. As each new generation of SEMI’s communications standards (SECS-II, GEM, GEM300, and now EDA / Interface A) reached critical mass, the compliance testing process naturally evolved from an ad hoc, manually driven set of procedures to a more thorough, formal process supported by automated testing software. Moreover, the use of this kind of software and the reliance of leading chip makers on its results has greatly contributed to the efficiency of the overall new fab startup and initial yield ramp process, so its importance to the industry cannot be overstated. So where does the industry turn for information about how to test for EDA standards compliance?Although the Sematech manufacturing consortium’s R&D program no longer includes SEMI Standards definition, validation, and promotion support, the work that its ISMI subsidiary (International Sematech Manufacturing Initiative) did in the formative years of the EDA standards is still directly applicable. 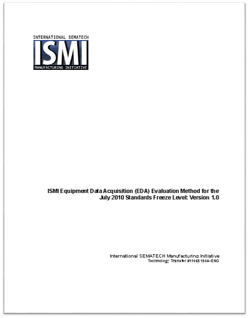 In particular, the “ISMI Equipment Data Acquisition (EDA) Evaluation Method for the July 2010 Standards Freeze Level: Version 1.0” is the globally accepted approach for checking compliance of an equipment’s EDA interface. This document takes an automation test engineer through the entire set of steps for connecting a tool to a known-compliant test client (in this case, the Cimetrix Equipment Client Connection Emulator, or ECCE Plus product), adding entries to the interface’s Access Control List (ACL), uploading and inspecting the equipment metadata model, managing Data Collection Plans (DCPs), and invoking all the other services defined by the SEMI EDA Standards suite (E120, E125, E132, E134, E164, etc.). Its appendices not only define the required procedures in detail, they also describe the expected results and suggest a format for reporting these to interested stakeholders. Of course, those familiar with the use of this method and the associated software tools know that it can take 2-3 days to execute this process manually, which is an inefficient way to check compliance for the incoming tool set of an entire fab. Fortunately, there IS a better approach. Cimetrix has automated these evaluation procedures in a way that ensures the target equipment meets the automation software purchasing requirements to the satisfaction of both the equipment supplier and the semiconductor manufacturer, while leaving the door open for factory-specific requirements that represent unique competitive advantage. Note that ISMI and its member companies also recognized that much of the potential value of the EDA standards would be derived from (and limited by!) the content of the equipment metadata model, so they funded the development of another software tool to check these aspects of a supplier’s implementation. But that is a topic for an upcoming blog – watch for it. So… if you want to know more about EDA testing and/or discuss your specific needs, contact Cimetrix for a demonstration of this exciting new capability! Anticipating and promoting the increased adoption of SEMI’s Equipment Data Acquisition (EDA / aka Interface A) standards, we’ve posted a number of blogs over the past 12 months to address questions that potential stakeholders have repeatedly asked across the value chain. These postings have dealt with everything from the factory applications enabled by EDA to the best practices for OEM implementation of these standards to the development of robust equipment purchasing specifications. Since the adoption process has now clearly reached critical mass, we must seriously address the question “How are we going to test the equipment and systems that incorporate these standards?” in a way that supports the entire industry. It’s an excellent question, and one that has a multi-part answer. Given the structure and expected use of the EDA standards, the acceptance testing process for a unit of semiconductor manufacturing equipment will include at least three components, each of which addresses a different aspect of the standards. Note that we’re explaining this from the perspective of the end customer in a semiconductor factory, since this is the most common use case, but most of the same principles apply when testing EDA client infrastructure/application components as well. Compliance testing – does the equipment adhere to the specifications described in the SEMI Standards, and were these specifications interpreted correctly? Will it cleanly connect to the EDA client infrastructure without modification or extensive configuration? Performance and stability testing – does the equipment meet the end users’ performance and availability specifications in terms of data sampling intervals, overall data volume transmitted, size and number of DCPs (data collection plans) supported, demands on the computing/network resources, up-time, etc.? Will it support the range of application clients expected in a production environment? Equipment metadata model conformance testing – does the equipment model delivered with the interface represent the tool structure and content anticipated by the end customer? If the customer has requested that SEMI E164 (EDA Common Metadata) be fully supported, does the metadata model meet these specifications? Of course, in addition to the requirements dictated by the standards themselves, most advanced semiconductor manufacturers will have a number of factory-specific requirements that must also be supported by the EDA interface. These may include special events and data for particular automation schemes, vectors of process parameters to support fault detection applications or other feature extraction algorithms, synchronization signals for external sensor integration, and the like. To address these requirements efficiently, an EDA test system should be extensible by its users. You can see how interesting and vital this topic becomes when you consider the range of requirements outlined above. We’ll explore each of these in more detail in the next few postings, so stay tuned!